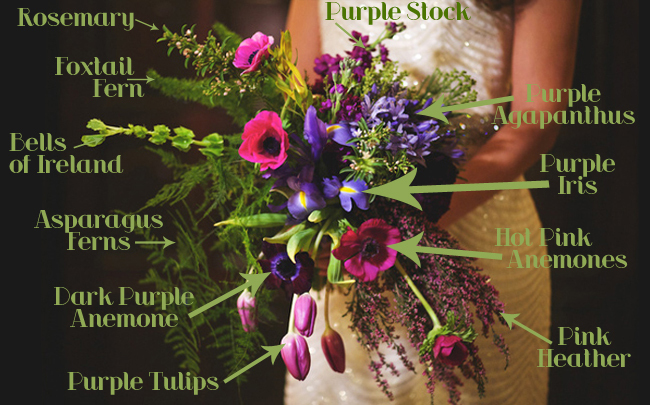 In spirit of this Celebration I thought it would be fun to do a Breakdown of a Mardi Gras Style Bouquet! I found the bouquet in a Mardi Gras Wedding Inspiration featured on Ruffled. The inspiration was designed by Ally B Designs and the gorgeous florals were done by I Bloom. After you view the breakdown I highly suggest you check out the rest of the inspiration since the whole thing is just stunning… Elegant and Fun! Lots and Lots of Flowers! 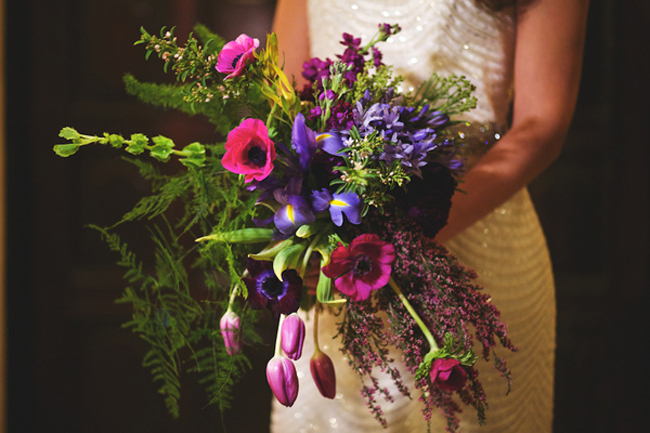 This Bouquet includes the following types of flowers and greens: Flowering Rosemary, Foxtail Ferns, Bells of Ireland, Asparagus Ferns, Dark Burgundy Purple Anemones, Purple Tulips, Pink Heather, Hot Pink/Fuchsia Anemones, Purple Iris, Purple/Blue Agapanthus and Purple Burgundy Stock. Want More like this? Check out All of our Bouquet Breakdowns! And as always, if you need a bouquet broken down, just leave a comment with a link to the image and I will do my best! Party Perfect Blooms for Under $100!